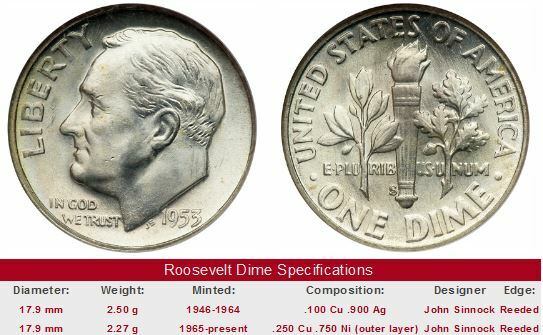 Plans to issue the Roosevelt Dime began soon after the death of President Franklin D. Roosevelt in April 1945, to remember his inspirational leadership throughout the Great Depression and World War II. The ten-cent piece seemed most appropriate to honor Roosevelt, because of his close involvement in the March of Dimes campaign, a charity organized to fight polio, an affliction under which the late president himself suffered. Mint Engraver John Sinnock was tapped to model the new Roosevelt Dime. His initial submissions and subsequent revisions were rejected by the Commission of Fine Arts. Instead, the Commission suggested a competition between America’s leading artists, in a manner similar to US coin design selection that had been in place ever since 1916. Director Nellie Tayloe Ross declined the Commission’s proposal, for the new dime had to be ready for circulation prior to the 1946 March of Dimes fundraiser kicked off on January 30, Roosevelt’s birthday. Sinnock conferred with Lee Lawrie, the sculptor member of the Commission, to again revise the model. The word LIBERTY on the obverse was moved from the top center to the left, allowing a lengthening of the head, plus some of FDR’s wrinkles were softened. The reverse carried a torch in the center, with an olive branch to the left and an oak branch to the right. These features symbolized freedom, peace, and victory, respectively. 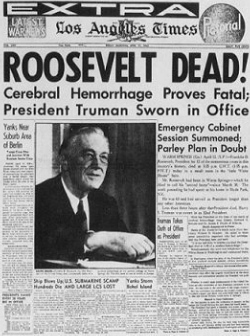 Worn out by the heavy burdens of his office, President Franklin Roosevelt went to rest at Warm Springs, GA, where on April 12, 1945, he died of a brain hemorrhage. News of his death shocked the nation. For millions of young men in the military, FDR was the only president they ever really knew. Monumental decisions on how to bring WWII to a close and the restructuring of the post-war world fell to his successor, Harry S Truman. On January 8, 1946, Treasury Secretary Fred Vinson gave final approval of the Roosevelt Dime. Director Ross ordered swift fabrication of the hubs and dies to begin production at the earliest possible moment. The Mint did in fact meet its target date of January 30, but just barely. When the first Roosevelt dimes reached the public, there were persistent rumors that Sinnock’s initials, JS, actually belonged to the dictator of the Soviet Union, Joseph Stalin. In the early days of the Cold War, many Americans were quick to conjure up diabolical conspiracies from normally innocuous events. When public outrage intensified, the Mint was forced to publish an official denial that communist agents had infiltrated its operation. One of the most valuable, readily obtainable Roosevelt Dimes is the 1982 no mintmark error dime. Beginning in 1980, the Philadelphia Mint added the "P" mintmark to coins produced there, with the exception of the cent, which continued to show no mintmark to indicate a Philadelphia origin. Somehow, at least one 1982 Philadelphia dime die had its "P" omitted. In January 1983, dimes bearing the 1982 date with no mintmark began showing up in Sandusky, Ohio. Shortly after its discovery, speculative activity quickly drove the price to above $300. As the fad wore off, prices drifted downward, and have been fairly soft for many years. In 1995, a 1982 no mintmark dime in MS-65 retailed at $225. In 2011, the same coin is selling in the neighborhood of $200. Experts believe no more than 15,000 of the goofs exist. Given its extreme scarcity relative to all other Roosevelt Dimes, it might be a sleeper worthy of your attention. There are also a few Roosevelt Dimes that are quite valuable because they're missing the "S" mintmark. These are the 1968-S, 1970-S, 1975-S (only 2 known! ), and the 1983-S). They're tough to find and will cost a four or five figure sum. While it is true the 1949-S is still not a super expensive coin, as always, we recommend caution especially if you're angling to hook a top quality specimen. What a shame if you thought you purchased an MS-67 example, only to later find out later other hobbyists wouldn't rate it anywhere near that lofty state of preservation. The best advice is to settle only upon coins that have been graded by one of the four leading certification companies: PCGS, NGC, ICG, or ANACS. The cost of certification may not make much sense for a circulated 1949-S, so at least be mindful of the seller's reputation. The right hand side of the box below is set up to search eBay for Roosevelt Dimes dated 1949-S in any condition. The left hand side of each box reports value trends since 1995 for the 1949-S in MS-60 condition, along with annual increase computations to compare with other coins. As a reminder, the link returns all 1949-S Roosevelt Dimes, not just those in MS-60.